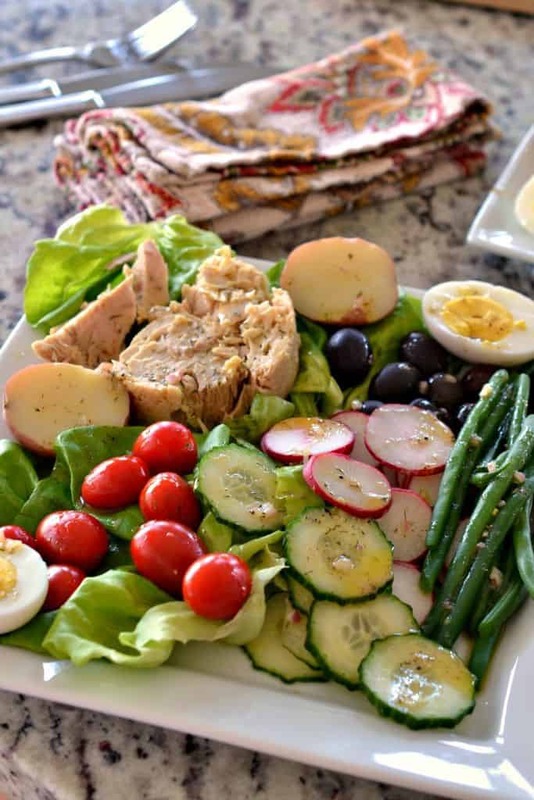 Why is it called Nicoise Salad? 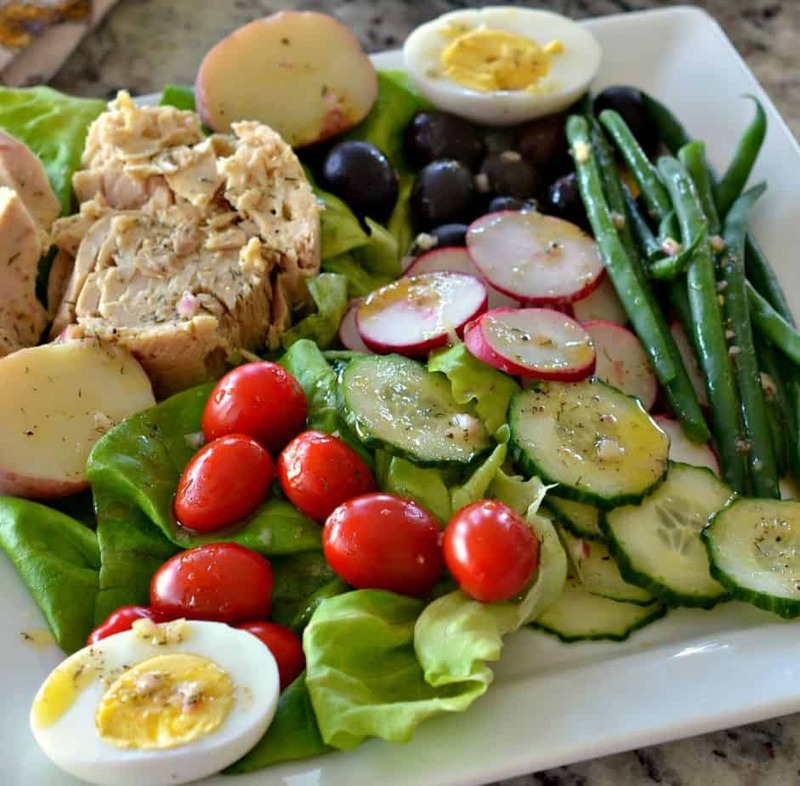 This traditional salad originated in the French city of Nice. Nice is located in the Provence region of France. 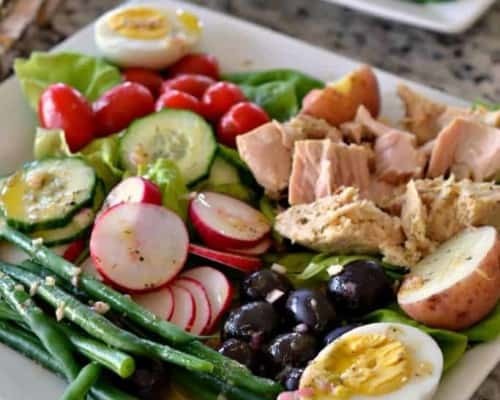 One of the signature ingredients for this salad is Nicoise olives which are also grown in the Provence region of France hence the name Nicoise salad or salad Nicoise. 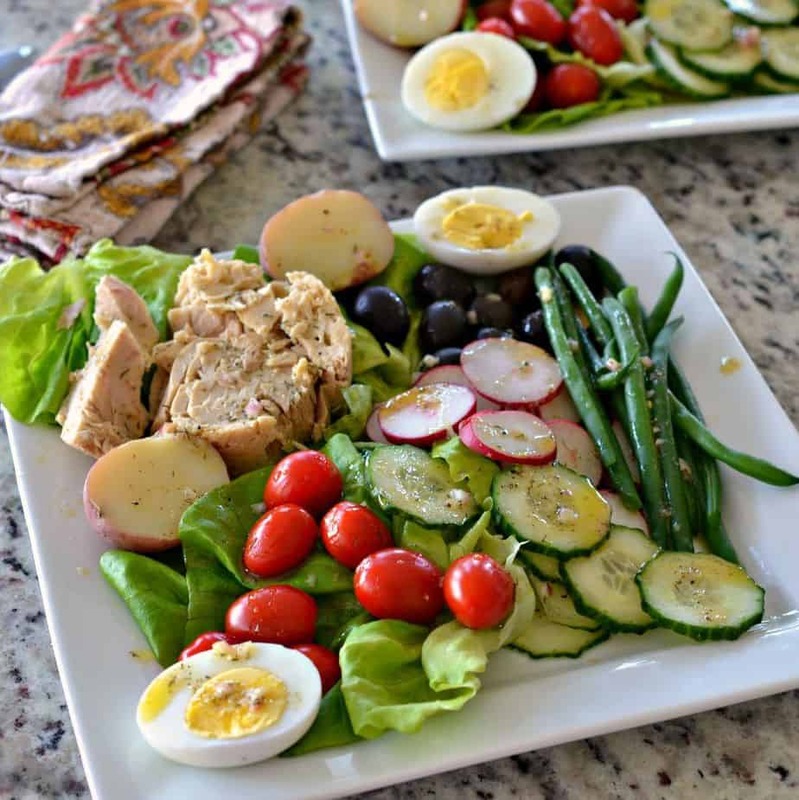 How do you make Salad Nicoise? A little advance preparation is in order with this salad. Put a couple of eggs and a teaspoon of baking soda in a saucepan full of cool water. Bring the eggs to a boil, cover and remove from the heat. Allow to set for thirteen minutes and them plunge in ice water. Place a few small red potatoes and one half teaspoon of salt in a saucepan full of cool water. Bring to a gentle boil and cook until the potatoes are fork tender. Add the green beans to the water the last couple minutes of cooking. Plunge everything into an ice bath to stop the cooking process. These tasks can be completed up to several days in advance and stored in airtight containers in the refrigerator. In a medium bowl whisk together the wine vinegar, minced shallots, mustard, dill and fresh ground black pepper. Drizzle in the olive oil while whisking continuously. Set the dressing aside till you arrange the salad on the platter. Peel your eggs and slice them and the red potatoes in half. Grab up to four large plates if you are doing this as a main meal or a large platter and spread out some some good crisp lettuce. 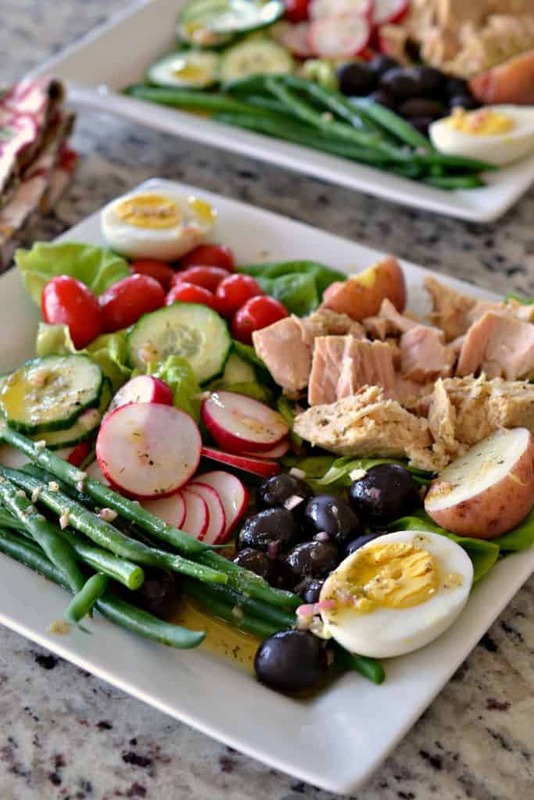 Top with tomatoes, cucumber slices, sliced radishes, Nicoise olives, green beans, halved eggs, halved potatoes and tuna. Drizzle with mustard vinaigrette and serve promptly. It is very helpful to cook the eggs, potatoes and beans in advance. Use good fresh crisp lettuce. I personally like Boston lettuce but you can use any variety or mix except iceberg. Mince the shallots extra fine for the dressing. If you can’t find Nicoise olives substitute good quality black olives. You can use fresh grilled tuna or good quality canned tuna. Feel free to add or swap with other goodies and make the salad unique to your taste preferences. Other salad recipes you will love! In a medium bowl whisk together wine vinegar, minced shallots, dill and mustard. Drizzle in the olive oil while whisking continuously. Season with fresh ground black pepper to taste. This is such a pretty salad and I love how you’ve plated it up – gorgeous presentation and it looks really appetising. Thanks so much Mandy! I hope you try it! It is delicious!! That salad is absolutely mouthwatering! I love interesting salads. Old-fashioned salads are so boring. I can’t wait to make this. I’m not sure I’ve ever had this salad before, though I know I’ve heard of it. Well I hope you enjoy it. Yes please customize your own taste! Such a filling and Nourishing salad. I love reading recipes with more info other than just the recipe. This is a wonderful idea for a salad…so fililng and satisfying too. I need to try this! What a lovely blend of flavors and colorful foods, all thrown together for one awesome meal! Can’t wait to give this a try! This looks really healthy and filling! Great addition to my meal prep! 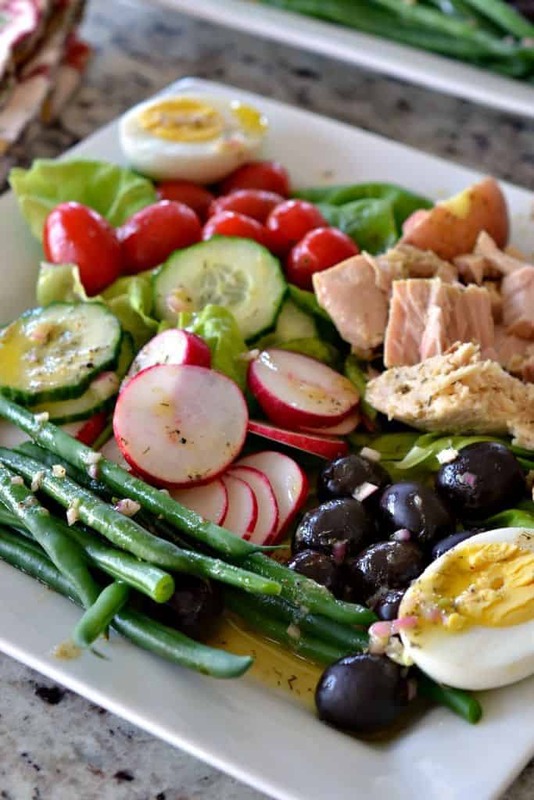 Oh I do love a Nicoise salad and this looks so colourful and delicious. Perfect option for a light lunch. Thanks so much Anne! I hope you enjoy it! This looks delicious! I love the fresh vegetables, and how can you go wrong with grilled tuna! Indeed Kita! I hope you enjoy it!! Now this looks like my kind of salad! I definitely need to give this one a try. I love salads, but have never had anything like this. I would love to try making this sometime. So dang on yummy!! I love tuna in my salads!!! Thanks Felecia! I love tuna in my salads also! That salad looks amazing! I am all for the fresh flavors now that we are headed into spring time! You learn something everyday, did not realise that it was named after its origination. A beautiful salad, perfect t for spring and summer lunches.